The start of the strike has been dubbed "Black Tuesday", but the action will spread over three months, affecting two days in every five. But Prime Minister Édouard Philippe denied this, saying the proposals aim to change the status quo that was "no longer tenable". In parliament, he added: "If the strikers are to be respected, the millions of French people who want to go to work, because they have no choice, because they want to go to work, must also be respected." Eurocontrol, which runs the EU's air traffic system, said the fault in the system had been identified and that moves were under way to return the situation to normal. The rail unions also feel their action goes beyond rail workers' conditions and marks a major test of union clout. 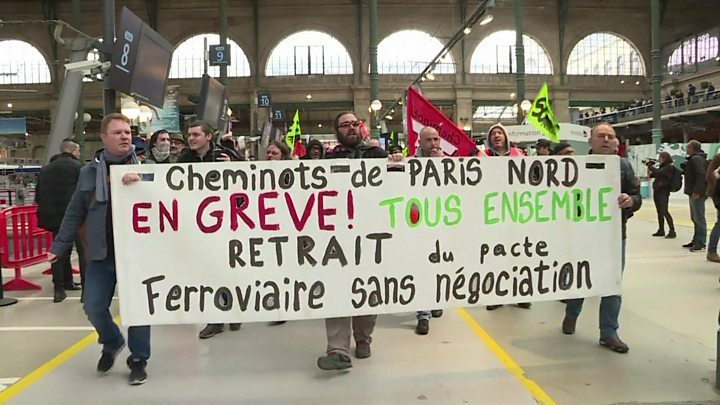 Mr Macron's Republic On The Move party also feels the strike has wider connotations. "We need to rid this country of its strike culture," spokesman Gabriel Attal said. The BBC's Lucy Williamson in Paris says many union members see Mr Macron as the man who wants to break the power of the unions. How have passengers been reacting? The usual mix of support, anger, disappointment, humour and resignation.